The elusive perfect destination for your wedding…this is what every bride seeks and to fill that expectation you have to truly be the answer to her dreams on many levels. For the bride that dreams of a setting that is exclusive yet warm and inviting to her guests, offers a breath-taking back-drop that adds magic to the photos of her very special day, and presents everything she needs from chef-inspired cuisine to a soothing spa treatment in one exclusive destination, Arnold Palmer’s Bay Hill Club & Lodge is the answer to those dreams. “Bay Hill Club & Lodge is perfect for the wedding party that seeks a more intimate setting without having to sacrifice all the amenities of a full-service resort destination. Your group will be front and center in the minds of each service professional, not one on a long list of functions taking place simultaneously. You become the priority, day or night, with our dedicated staff completely at your disposal. We believe this how every bride should be treated on her special day, “ said General Manager Ray Easler. Taking advantage of Florida’s beautiful weather is easy to do at Bay Hill Club & Lodge with a variety of beautiful indoor and outdoor locations. From a small, intimate gathering to receptions for up to 400, you’ll find the perfect venue for rehearsal dinners, showers, wedding ceremonies or receptions. And perhaps more importantly, a staff that takes pride in providing a level of service that is both anticipatory and gratifying. The intent is not to show you a standard cookie-cutter wedding package, but to meet with you to understand exactly what your special day should look and feel like, and then become your partner in exceeding those expectations. They will also attend to all of the details that guarantee your guests are equally satisfied from their comfortable lodge accommodations (guest cottages are also available) to perhaps tee times on Bay Hill’s prestigious golf course (as a lodge guest you can play golf on the same course the PGA TOUR pro’s play each year in the Arnold Palmer Invitational Presented by MasterCard). Bridal parties especially love the exclusive services offered at the Spa & Salon at Bay Hill, as well as the proximity to exclusive designer shopping offered at nearby Mall of Millennia. 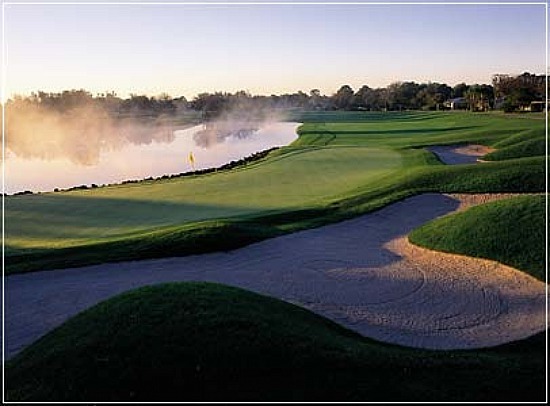 Located just 20 minutes from downtown Orlando, Arnold Palmer’s Bay Hill Club & Lodge is the site of the annual Arnold Palmer’s Invitational Presented by MasterCard golf tournament. The 70-room property features 27-holes of golf, the Arnold Palmer Golf Academy, tennis on four Har-tru courts, a full service spa and salon, fitness center, four dining locations, and 9,000 square feet of meeting and banquet space. For reservations or membership information, call (888) 422-9445 or (407) 876-2429. "Mulligan" Package at Villas of Grand Cypress Gives Couples A Second Chance To Say "I Do"